To sum up this year’s World Barista Championship (WBC) in Bogota, I decided to talk about the cast of this movie that played out. There were many (almost Lord of the Rings size) cast members; some extras, some leading roles. I am sure I have missed out Gandalf somewhere in this, but if I don’t mention you, I loved everyone. 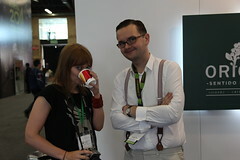 WBC makes me all warm inside every-time I attend one. 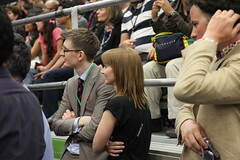 John Gordon and Jessica McDonald team UK were (as always) amazing. Two of my best buddies in coffee (and the most amazing couple). John rocked on stage, was proud to be a Brit and when he made semis I let out a the biggest shout. I know how much it meant to him to make semi finals after not getting the breaks he deserved last year. But to go one better and make finals was even better (and raised an even bigger shout). 6th I didn’t think for me mirrored his performance, but I am biased, and being there was vindication for all Jess’s (his trainer and fiancée) and John’s hard work, and not nearly enough reward for the amazing people they are. This is my next couple that are amazing. From Square Mile Coffee Roasters, no-one knows competition better than these two. Been there bought the T-shirt, printed the T-shirt, bought the T-shirt factory, changed the design of T-shirts into Jumpers and we still claim them as T-shirts. These guys pop up in a cameo role at the end so keep them peeled for that, but honoured to call them good friends, I owe them both so much, not just in this competition but in life in general. Otherwise knows as @otherblackstuff on twitter, and R&D for Marco Ireland. We have history. Fun times were had in Atlanta with Team Ireland. Dave is such a clever coffee brain and I owe him lots. We both changed our colours to help our next star of the film, but the plot was the same, emotional roller-coaster fun and no one got the girl. 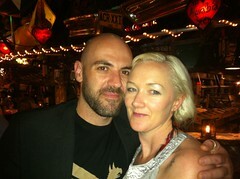 This year he stepped up for our second film role together, and we rocked, and much much fun was had. Sadly the star of the prequel for this was not in attendance; Mr Harmon was sadly missed http://www.iscolinharmongoingtobogota.com. The star who took his place was far better looking than him so in some ways a casting success. Dave thank you so much for the hug on stage after the winner was announced. Just for a second I felt that amazing friendship we have always had since the finalist announcement in Atlanta. I still hold that as one of the most amazing feelings I have ever had and that man hug was right up their with it. 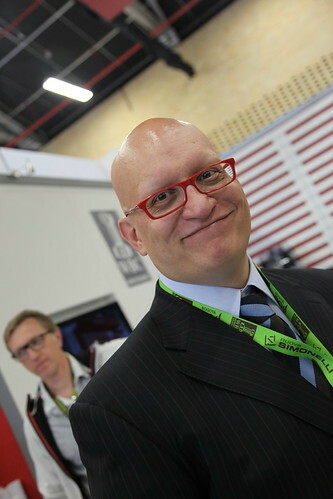 Simonelli are the machine sponsors. I normally have no to little time for sponsors of competitions they send along one guy to do the long speech at the end to claim credit, and send a huge cheque. 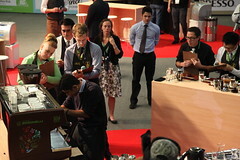 But Simonelli have changed the way that barista competitions should be run. They supply machines but more importantly they supply people. 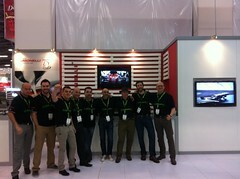 It’s a big team, but special special thanks to Lauro and to Cosimo and to Giani. Big guys who I hope get the machine sponsorship that’s up for review for the next three years. The comp would be a poorer place without them, and I hope the manpower they provide is a big part of the decision making process. Cindy is responsible for putting on the show. Yes it’s her job, but she did a super job at this one and I tip my hat at the organisation. To pull this off in Colombia takes some doing and she did it with bells on. Best film ever? Let’s call her the director Peter Jackson. A small cameo, but I spent quite a bit of time talking to Klaus at the barista party. I missed two coaches back to the hotel doing so but it was some of the best time I spent during the week. Insightful, intelligent and most enjoyable. Was a great champ in 2006 – my first competition – and I still have to pinch myself he has time to talk to me. But watch Klaus at any event and he always finds time to talk to everyone. A true gent and thank you. Stephen I have known for a while. He was the 2008 champion in Copenhagen. Stephen now works in the US for Inteligensia. Saturday night I was feeling worried and strange about the finals the next day. His role in this film was to help me clear my mind, and help me see what competition is all about. Friends. I’m honoured to call Stephen a friend, he’s a clever clever man, and his wise words helped me focus my mind for the Sunday. Thank you so much. Our replacement for the Harmon who was away working on another film. 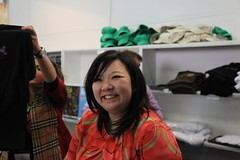 Monika won the Slovakian Barista Championship two weeks before the WBC. Not an excuse, just a fact. Time was not her friend to book accommodation, flights and most importantly build a routine. We were changing the routine 20 minutes before the presentation. Not because we wanted to, because we had to, to make it solid. Monika works for me and Colin at 3FE so when the Slovakian SCAE did not pay for a barista buddy to come with her, I stepped up as her boss and offered to polish glasses and build trolley and look after what she needed. Any one who has been a barista coach knows it’s a tough job and puts lots of pressure on your shoulders. Colin will tell you that this is not where my skill set is. 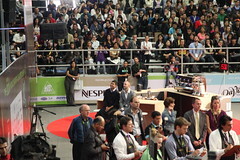 I had lots to do at the WBC, lots of people wanted to talk, a piece of my time, and four other baristas’ shots to taste too. It all meant that Monika ran the risk of being let down by me. I hope she feels I stepped up, it was amazing to learn what the “coach” has to do. I was fetching milk, I was polishing glasses, I went to buy trays the day before comp, I was motivator, shoulder to cry on, bad news breaker, harsh critic, taster, problem solver and I hope the most important one: friend. I will be Monika’s friend forever, and I hope she thinks I filled the roles (and had fun trying). I just wish I could have gotten the broken grinder repaired that arrived in Bogota. Would it have made any difference? I don’t know, but it could only have helped. Unfortunately she ran over time and didn’t make the semis after disqualification. I hope the Slovakian SCAE brings the competition back a little for next year to give the champ a fighting chance. 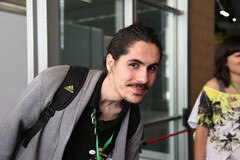 The guy from Turkey bought off the website and competed with Inglaterra and with Colombia COE Los Cochas. He didn’t speak English, but he did a good job, and we have told him if he wins next year we’ll train him and make sure he gets the coffee he wants. Lovely guy who I was so proud to watch. Another barista that used our coffee, Vicky had her partner for support, so I stepped back pretty much. While I did this she stepped up and did a solid performance. Was great to see Vicky get her chance on the WBC stage and I really hope she follows up on her promise to judge competitions from now on, as she will be a HUGE asset to the Irish competition as a judge and can help baristas in the future. 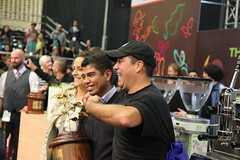 Frederico and Lily husband and wife partnership (and Lilly the 2006 – 2007 champion) and Frederico the coach of the last 5 champions and coach of the top three from El Salvador this year. I love this man (and of course Lilly) who are another amazing coffee couple, their dedication and drive is inspiring and amazing. Our star of the show who is next deserved his victory, but Frederico I felt deserved it just as much. During the results for the finals I had to tell him to breathe it meant that much. They deserved this win just as much as Alejandro and I was just as pleased for them. Reg and Julie Barber for the party; The Canadian Fernwood team, you rocked; mahlkonig in particular Kristian Klatt, and many many more too many to mention, you know who you are. The plot of this movie starts back in late 2005 when one of our co stars approached me in my little roastery. In steps James Hoffmann; handsome, eloquent but green to competition, and after building a team. I became part of that team that went to the UK finals in 2006 and the WBC in Bern in 2006. 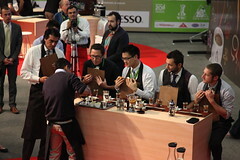 We finished 5th and it was the first step of the UK being well represented in WBC finals. 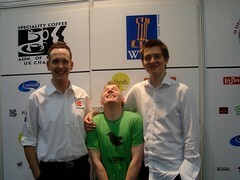 In 2007 I also worked with James exclusively and we bagged another UKBC for the second time. James set up Square Mile and went on to win the WBC and dominate the competition for many years. 2009 and 2010 our missing star from this blockbuster stepped into the frame, and we finished 4th in the WBC two years on the trot. No mean feat, I can tell you Colin is an amazing barista who is super talented. WBC finals don’t just come along – three in five years is fairly impressive for most. I’m privileged to work with some of the most amazing baristas, it’s their work that does it, but I became quite obsessed with barista competitions. But after 2010 and London I was in a dark place with competition. 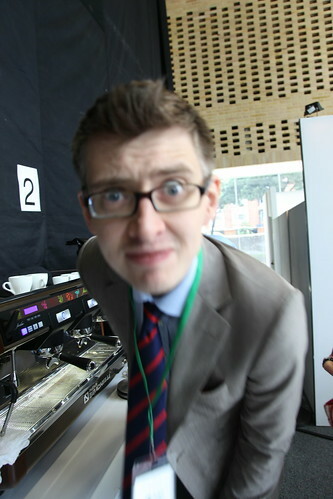 If you want a small insight into this take a look at http://www.hasblog.co.uk/world-barista-championships-2010-wrap-up for how dark the place was. Strike the new year and our end of year review, I look back at the cast of this and past movies of WBC and realise how many very special friends I have made. The cast have become my good friends, and I get a chance to play a bit part every year in this amazing movie. I get to mingle and rub shoulders with them and without competition I would be, and so would Has Bean be, a poorer place. So I decided this year we would be all in. But I have chased that win, looking for some kind of vindication, some kind of pat on the back for having coffee good enough to work with the best barista in the world. No matter how much praise I get and no matter how Has Bean goes from strength to strength, this kind of mattered to me. It began to feel like chasing a shadow that could not be caught, to quote David Walsh from his blog post. It felt like we couldn’t supply the golf balls to make it across the water. It’s crazy, I know we have some of the best coffees in the world. We have some great golf clubs and some awesome golf pros. So I met this young man last year in London. Straight away I liked him. A bubbly character who I clicked with and who knew Ernesto, my favourite farmer. His boss who I had known for a couple of years longer was just as inspirational, a great guy who bleeds coffee. Alejandro finished in the semis and did VERY well, he looked like one to watch, he finished 11th which was amazing, but not earth shattering. This year I travelled to El Salvador on a buying trip. 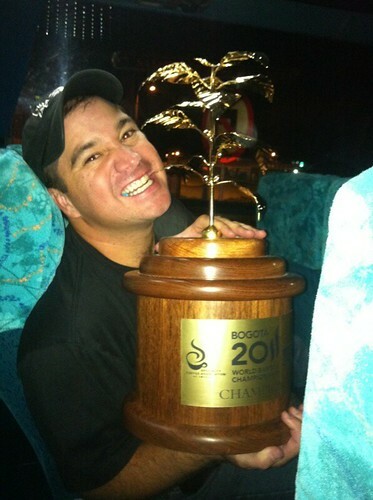 Remembering this guy who stood out in my mind I emailed Frederico, the owner of Viva Espresso and Alejandro’s boss, and asked if I could do anything to help with their national championships. He replied back: only if you bring some coffee. So I sent some samples to try, and in my luggage I took Alejandro’s national competition coffee, and watched the whole team’s run throughs. I came away inspired, and confident they would all do well, but struggling to split them. I hoped the guy I was involved with would do well. Sat in a hotel in Costa Rica watching the ropiest stream on the worst internet connection known to man I let out an audible yelp (not for the first time I was to find out) when he won. 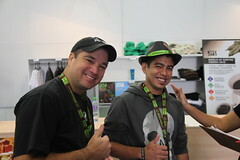 I was so proud, a guy at origin using coffee I brought to the UK and roasted then took back to El Salvador. So not sure they wanted to try the same thing at Colombia I emailed Frederico and asked if he wanted to try again, to which I received an emphatic yes. So I’ll cut to the final scene. Picture this, the crowd wait, the six gladiators step forward. Just back stage there is the entire Team El Salvador (of which I was a member) huddled together, the tensions builds. Sixth to third get mentioned, no Alejandro. 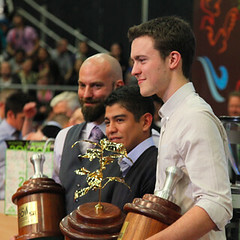 Top two USA (last year’s winner) and little old El Salvador. The winner is …. Well you know the rest. I cried for the first time since I was about 16, I blame Hoffmann, he came over to congratulate me and that was it, tears, dribble and runny nose – the whole thing. So pleased to be a small part of it, a monkey shaken and now I can get on with the fact that I want to spend every year meeting this cast of actors and actresses who make it the special event that it is. We were always good enough, and we can be in the future, but it comes down to the amazing talent of the barista, not the roaster. We make the golf balls, but it doesn’t make you a golfer. It’s a team approach, and everyone plays their part, I’m pleased I make golf balls good enough to go across the pond. 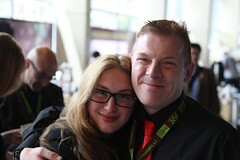 In conclusion it’s the Best WBC I’ve ever been to. But looking forward to the sequel as I’m sure it will be better. …and I agree re the man hug, it had that Italia ’90 feel to it!! Cool post Steve, absolute fair play, delighted you get the recognition you deserve. Passion, drive, enthusiasm and talent, you’ve got it all in bucket loads. Only great coffee can be turned into something special and that’s what happened. I’m sure this will throw yourself and HasBean on to even more great things. You even managed to stay professional and get your inmymug vid out with a whopping hangover the following day! 🙂 Impressive! Dave … Paul …. thank you guys so much. Dave hunting and gathering not going well, but I hear you on the italia 90 thing but though it would be more a USA 94 for you. 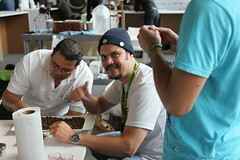 Love to your job, love to your friends, love to all coffee world…. We really want to congratulate you! You and your team and your friends and your family definitely deserve it! Great post Steve, thanks for sharing it with us. There was water in my eyes as I shared in your emotion. What a wonderful post. Now I really feel like a fool for not speaking up more while at the dinner table at the party. Seriously, as a judge I don’t get to spend any time around the competitors area and really had no idea who was at the table besides Monika, James and Anette. Anyway, as one of Monika’s sensory judges, I strongly believe that she has what it takes to be a finalist. It was painful to watch the seconds tick away as she approached 16 minutes. It was an honor to be at that table; I’m sure she is going on to great things in the coffee world, either in or out of competition.